All India Ann Dravida Munnetra Kazhagam (Amma) Deputy General Secretary T T V Dinakran on Tuesday announced that senior leader and Rajya Sabha MP R Vaithilingam has been removed from the party. The move came a day after Vaithilingam, a loyalist of Chief Minister K Palaniswami, said steps would be taken for the removal of jailed party chief V K Sasikala from the AIADMK. Vaithilingam, AIADMK's Thanjavur (South) district secretary, was being removed from all posts, besides primary membership for 'going against the party's policies and bringing disrepute' to it, Dinakaran said. 'I request party workers to not to have any truck with him,' Dinakaran said in a statement. He added that the announcement was being made with the 'approval' of Sasikala who is serving her jail term in the disproportionate wealth case in a Bengaluru prison. During the merger of the two AIADMK factions on Monday, Vaithilingam had said measures would be initiated soon to expel Sasikala from the party, conceding to a key demand made by the faction led by former chief minister O Panneerselvam for the unification. Vaithilingam, a former minister, was named party deputy coordinator during the merger event at the AIADMK headquarters in Chennai. Dinkaran also dubbed the merger of two factions of the AIADMK as a 'betrayal' of Sasikala. Dinakaran, in a series of tweets on Monday night, also questioned the durability of the arrangement. 'It is not a merger. It is a commercial agreement reached for self-interest and hunger for positions and to protect posts,' he claimed. Stating that his political journey would continue, he vowed to protect the party and retrieve its 'Two Leaves' symbol which has been frozen by the Election Commission ahead of the now cancelled April 14 byelection to R K Nagar Assembly constituency. Dinakaran, nephew of Sasiakala, said he was suffering from sore throat and fever and had been advised rest and would meet media on Wednesday. 'Only god knows how long this (merger) will hold. In 1989, in deference to the wishes of cadres, Amma (late chief minister Jayalalithaa) was accepted as the general secretary and all united under her leadership,' he said. Dinakaran was referring to the then reunification of the party after a split following the death of AIADMK founder and late chief minister M G Ramachandran in December 1987. The split ensued after Ramachandran's wife Janaki was appointed chief minister and Jayalalithaa claimed the support of the cadres. 'But today, the cadres cannot digest the merger which is accompanied with the announcement that steps would be taken to expel the general secretary (Sasikala) who was accepted by themselves,' he claimed, adding that it was a 'betrayal'. Dinakaran claimed not only the AIADMK cadres, but even the public would not forgive 'those who betrayed the general secretary who made Pannerselvam and Palaniswami the chief ministers after the death of Jayalalithaa'. Charging that it was Panneerselvam who was instrumental in the freezing of the AIADMK symbol, he sought to know how the cadres would accept it. 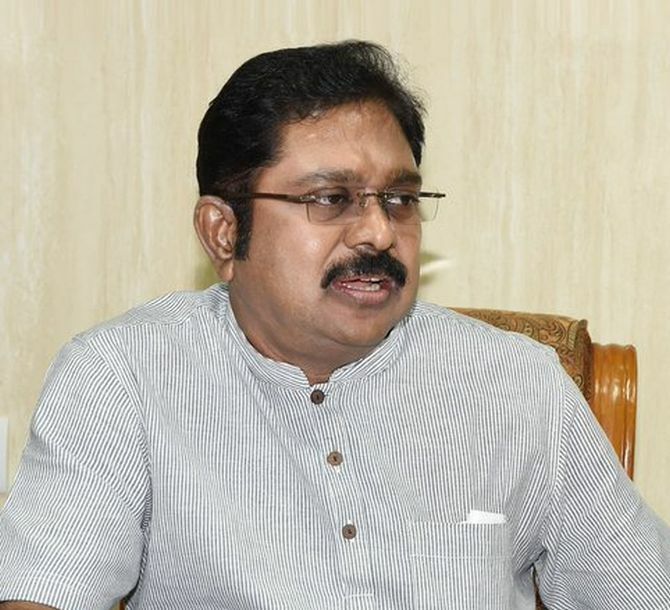 'How can they (Palaniswami camp) join hands with Panneerselvam who till yesterday was branding the regime ruling the state as corrupt,' he said. His tweets came hours after the factions merged and Panneerselvam, who had challenged Sasikala's leadership, was appointed the deputy chief minister and his close aide K Pandiarajan a minister.